Although bacteria appear simple under a microscope, each organism possess a complexity beyond anything created by the intelligence of man. As far as is known through experimental science, no life form simpler than a bacterium is possible. 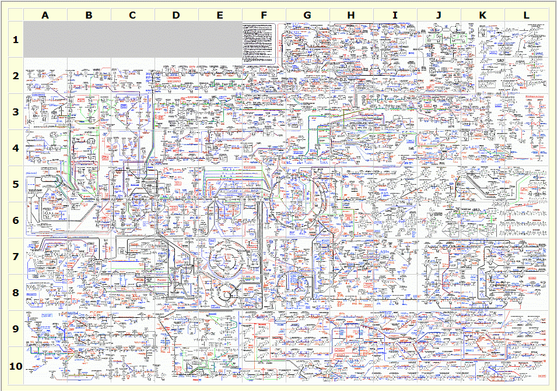 Note a very crude biochemical flow chart of single cell life (right). When Charles Darwin first proposed his general theory of evolution, the specific subject as to how life arose from non-living matter was avoided. Evolution by natural selection dealt with the change from one living organism to another. Each successive step was preceded by a pre-existing complex organism that was capable of reproduction. The alleged changes occurred incrementally from one degree of complexity to another. In the case of life evolving from raw materials to complexity, one cannot invoke natural selection as a driving force because raw materials don’t reproduce themselves, compete for food, etc. Regardless of how “simple” the first “life” might be imagined, one is left with a level of complexity that remains far too great to suppose that all of the necessary components could have somehow “come together” through random, undirected events. Thus, bridging the gap between non-living and living requires accepting enormously improbable events to have occurred. At the time of Charles Darwin, biologists knew little about the great complexity of life. Single cell life was thought of as relatively simple. A cell was viewed by many biologists as an amorphous mass of protoplasm, no more complex than a bowl of gelatin. It was supposed that life could be easily formed by combining and recombining simple chemical substances such as carbon dioxide, oxygen and nitrogen. * Today, it is understood that a bacterium is a profoundly sophisticated assembly of millions of interacting parts which form a "machine" greater in complexity than any technology produced by man. It is frequently taught in textbooks of general biology that single cell life evolved over approximately the first one billion years of the earth's existence. The great complexity of the cell is the reason why such an enormous time period has been allotted. It has been assumed that the earth was covered with a primitive ocean, a so-called "primordial" or "pre-biotic" soup. This vast depository is presumed to have contained various amino acids, simple sugars, phosphates, ammonia, and other building blocks of life. It is hypothesized that the atmosphere contained no oxygen, because the presence of oxygen would have caused rapid breakdown of any simple proteins formed. However, a lack of oxygen would also have resulted in no ozone layer, which would have resulted in intense ultraviolet radiation, which would have immediately denatured any pre-biotic precursors. In any event, there is no geochemical evidence that such a mixture, the so-called "primordial" or "pre-biotic" soup, ever existed. With man's ever-increasing knowledge of single cell life, it has become apparent that the gap between life and non-life is the greatest gap in nature. The proposal that raw materials could randomly come together and form a cell without any intelligent input requires a greater leap of faith than accepting the entire evolution of man from single cell life. In the nineteenth century, principles of molecular biochemistry and inheritance were poorly understood. Early proponents of Darwinism imagined that with further advances in science, a continuity between life and non-life would be discovered. They expected that ongoing research in science would validate the theory of common descent. Most biologists who promote abiogenesis today do so because, they reason, it is a logical extension of Darwinism. No one can offer any direct evidence that abiogenesis ever occurred or that it is possible. The doctrine of atheism, so fundamental to acceptance of evolutionary theory, requires abiogenesis. An understanding of this principle explains why so many can accept a theory that in and of itself has no scientific validity. During the past several decades, the extreme complexity of single cell life has become progressively appreciated by scientists who study cellular biology. The fundamental problem with any proposal of abiogenesis is the hopeless improbability of any single component of a cell to spontaneously self-organize. Without a functional genetic code, there is no theory as to how natural selection could work to build up a cell from more primitive components. "This is the smallest hypothetical cell that we can envisage within the context of current biochemical thinking. It is almost certainly a lower limit, since we have allowed no control functions, no vitamin metabolism and extremely limited intermediary metabolism. Such a cell would be very vulnerable to environmental fluctuation." If one accepts Morowitz's hypothetical cell to be the lower limit of possibility, i.e., the simplest conceivable self-replicating cell, then one must assume that such a cell somehow spontaneously came together from a random mixture of chemicals. Analysis of any single component of the cell alone results in staggering mathematical improbabilities. The profound gap between life and non-life is evidenced by the existence of organisms smaller and simpler than bacteria that cannot reproduce. The simplest life form, Mycoplasma genitalium, contains over 500,000 base pairs in its DNA. However, they are required to parasitize host cells with far more complicated organelles in order to reproduce. The smallest microorganisms are Rickettsiae and Chlamydiae and are considered by many microbiologists to be the smallest possible life forms. Although they each contain millions of complex parts, they are too simple to be considered autonomous life in that they act as parasites on more complex host cells for survival and reproduction. Viruses are also much smaller and simpler than bacteria. Their genomes range in size from 3,200 to 1.2 million base pairs. Despite their complexity, they require a living host cell to reproduce and therefore cannot be considered as true life forms. Evolutionists sometimes argue that the probability of spontaneous generation of a specific life form cannot be considered because evolution could have taken any one of conceivably millions of possible pathways. This challenge can be easily answered. First, there is no evidence that any genetic code other than DNA/ RNA could support life. Second, even if one allowed for trillions of trillions of possible pathways, the odds remain far too remote. Evolutionists, in describing the creation of life on earth, frequently refer to “primitive” or “early” living organisms as simple. This is a deceptive misnomer. All life, including single cell life, is exceedingly complex. With each passing year, the unparalleled complexity of single cell life becomes progressively apparent. When DNA was first described by Watson and Crick in 1953, it was realized that all life possesses a genetic code. If we look at the genetic code of DNA, we find that even a bacterium, the “simplest” form of single cell life known, is equipped with DNA three million units in length, approximately the same number of subunits as all the letters in the King James Version of the Bible. Each unit is composed of specific subunits that are aligned in a precise sequence. It is believed that single cell life as we know it must have had simpler precursors which survived and reproduced in a “pre-biotic soup” which spanned a time period of about one billion years of earth’s history. As to what properties these simpler precursors possessed that enabled them to survive and replicate, there are no answers. As to why every one of the millions of hypothetical precursor species that evolved over a billion years of history became extinct remains unexplained. Pre-bionts and proto-cells are proposed, but cannot be described in detail. The proposal of hypothetical pre-biotic life forms is not founded on any experimental science. Many believe that early life forms were based on RNA rather than DNA. If such entities could be created by random events, then molecular biologists who advance such theories should be able to create them in a controlled laboratory environment. Such experimentation is not undertaken because no one can postulate how such an entity could survive and reproduce. The suggestion of pre-life precursors, although shrouded in scientific language, brings to mind the 1985 classic movie "Back to the Future". In explaining his time machine, the eccentric scientist Dr. Emmitt Brown revealed the epiphany that made his invention possible; the flux capacitor. Because no realistic proposal for time travel is conceivable, a diagram composed of three converging elements surrounded by meaningless mathematical characters is provided, meant to look plausible to the uninitiated. Dr. Brown explained that while his time machine had all the necessary hardware to travel through the "space-time continuum", 1.21 jigawatts of electricity needed to be channeled into the flux capacitor to break the time barrier. Although most educated people are amused by such caricatures of science, this explanation for time travel is analogous to proposals of abiogenesis. The gradualistic formation of pre-bionts is suggested. Like the flux capacitor, they are described using technical biochemical language, but no one has the slightest idea how they would work. Like the 1.21 jigawatts of electricity channeled into the flux capacitor, the only requirement proposed to drive the evolution from pre-bionts to single cell life is one billion years. Although such explanations might appear plausible to those unfamiliar with science, they are immediately dismissed by those who are acquainted with the realities of biochemisty. Despite years of research and experimentation, no viable theory as to how life could have spontaneously evolved has been proposed. All evolutionists agree that a functional bacterium as we know it today (the simplest single cell life) could not have evolved directly from inorganic matter by chance in a single step. What is being sought at this time are laws of biochemistry, yet to be discovered, that allow for the preferential spontaneous assembly and subsequent replication of complex molecules. It is believed that if the right conditions exist, life will evolve into existence because of unknown laws of nature that drive the assembly of matter toward life. Such a proposal invariably requires at least hundreds of millions of years to occur and therefore cannot be observed by man. There remains only one explanation for this grand leap of faith. There is a pre-drawn conclusion that evolution occurred, and therefore that abiogenesis occurred. Rather than look at abiogenesis as the fatal flaw in evolutionary theory that it is, the evolutionist displays unwavering faith that a naturalistic process exists that conforms to a predetermined worldview. Frequently the concession is made by evolutionists that God might have created the first single cell life just to get the evolutionary process started, but thereafter retreated and allowed natural selection to take its course. Later in life, Charles Darwin admitted that perhaps the first life was formed by an intelligent creator. * This separation of evolution from abiogenesis leads to the suggestion that God might have been necessary to create life, but thereafter was not necessary. Since so many conceptual impossibilities to evolution are obvious, it is illogical to suppose that God was necessary to solve one enormous obstacle, but thereafter was not. Life flourishes in many different environments on earth. In the depths of the cold, dark seas, on the tops of mountains, in polar regions, in deep caves, in brine pools and virtually everywhere where conditions are within a given range of variability. It appears to many that diverse forms of life have found a way to survive under virtually all conceivable conditions. Many believe that if conditions are favorable, life will inevitably form and adapt. This belief is not founded on science, but is based solely on the paradigm in which we live. A majority of biologists today believe that evidence of life, present or past, will be found on Mars. This conclusion is made in spite of the extremely cold weather, lack of a suitable atmosphere, and absence of liquid water on the Martian surface. The predictions that life will be found on Mars are founded on the belief that somewhere conditions probably exist (past or present) that would be compatible with life as we know it. The basis for such a belief is the observation that life seems to fill every possible niche on earth, coupled with the assumption that evolution produced it. Although life is ubiquitous on earth, it must be remembered that all life originates from other life. It is tempting to imagine that because life exists in so many niches on earth, a natural force must exist to create and perpetuate it everywhere conditions are favorable. Given the fact that life is everywhere on earth, it is difficult to conceive of a planet endowed with the right conditions and raw materials for life to remain sterile for millions of years. Regardless of one’s paradigm of thinking, scientific knowledge indicates that life cannot come into existence without pre-existing DNA. 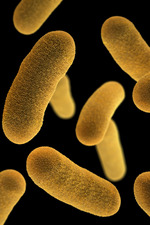 Although single cell life looks simple under a microscope, a bacterium possesses a complexity beyond human comprehension. Man is far from capable of creating a machine that can replicate itself from raw materials. To imagine that any conceivable life form could come together undirected from inorganic matter is no different than believing that a complex machine could be thrown together by chance. There is no principle of chemistry, physics, or biology that suggests that matter in and of itself possesses a propensity to form life. In all proposed descriptions of abiogenesis, it is imagined [although never stated] that some unseen driving force is propelling matter to organize itself into precursors which will eventuate in a living cell. Unorganized matter left to itself remains unorganized. Tens of thousands of hours have been spent and numerous scientific papers published on the subject of abiogenesis. Numerous hypothetical scenarios have been proposed that could have led to spontaneous formation of organic proteins compatible with what would be required in pre-life precursors. An attempt to summarize these studies is beyond the expertise of most readers to even understand. Suffice it to say that no pathway has ever been proposed that remotely explains the self-organization of DNA or spontaneous generation of single cell life. Many imagine that unknown laws of biology, yet to be discovered, existed that enabled non-random complex protein and DNA assembly. All probability calculations that have been employed to calculate DNA self-assembly result in staggering improbabilities, impossible to accept by any objective scientist. Thus, those with unwavering faith in abiogenesis and, by extension, evolution imagine the existence of unknown laws that allow for the spontaneous generation of life. Since life exists, they reason that there must be laws in operation that direct the self-organization of matter. There is no evidence that any molecules on earth are in the process of evolution toward single cell life. Abiogenesis is believed only because of the existence of life coupled with the refusal to consider that intelligent design might have been required. Frequently the proposal of abiogenesis is defended by pointing out that many different nucleotide arrangements might have been possible to produce life. While multiple varied sequences might be possible, infinitely large numbers are not. Using a similar line of logic, it is argued that non-random molecular bonding affinities of nucleotides have been observed. A comprehension of probability concepts leads to the realization that self-assembly of functional DNA cannot be considered as remotely possible. It has been estimated that the probability of one strand or purposeful DNA coming together by random molecular interactions is about 10-40,000. * If one trillion trillion trillion different possible sequences were compatible with life, and one trillion trillion trillion non-random bonding affinities were factored in, self-assembly of functional DNA would be increased from 10-40,000 to 10-39,946. Regardless of how many different scenarios are imagined that could have created life, the employment of probability calculations in the proposed spontaneous generation of a genetic code invariably results in irrefutable impossibilities. The profound implausibility of abiogenesis has led eminent scientists, including Francis Crick, the co-discoverer of DNA, to embrace a belief of panspermia. This theory proposes that single cell life did not evolve on earth, but was seeded from outer space. Such a theory, of course, is a frank admission of the hopelessness of trying to explain the origin of life in terms of naturalism. Such a suggestion introduces yet another vast improbability; that a life form could survive an interstellar voyage involving great temperature extremes that would surely have required at least thousands of years to complete. For those with unwavering faith in Darwinism, the belief in panspermia only shifts the problem to another planet so that one can distance himself from the dilemma altogether. One is still at a loss in explaining in terms of pure materialism how the first cell came into existence. With a growing understanding of the complexity of single cell life, acceptance of the theory of panspermia has been increasing among atheists. 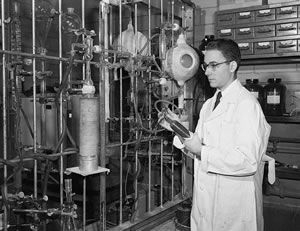 In 1952, a famous experiment conducted by Dr. Stanley Miller was designed to investigate the possibility of producing life in a laboratory. The experiment was made to simulate the primordial soup and to mimic atmospheric conditions of the primitive earth as they were believed to have existed. The experiment utilized ammonia, water, methane, and hydrogen. An electrical current was applied to simulate lightening. This description is a simplification of the actual experiment. The net result of the experiment was the production of 5 amino acids. The compounds produced constituted a racemic mixture, i.e., both "right-handed" and "left-handed" forms were produced. This is problematic, given the fact that only the "left-handed" forms are functional in nature. Some sugars, lipids and simple proteins were also formed. Subsequent variations of the Miller-Urey experiment have produced a greater number of amino acids. However, no experiment has ever been conducted that demonstrates that life could spontaneously self-organize under highly controlled laboratory conditions, let alone in nature. This well-known experiment has been used by evolutionists to suggest that abiogenesis is possible, and that the formation of amino acids and other simple organic compounds is not entirely "random". This is again an illogical extrapolation. Anyone who has an understanding of the extreme sophistication of the simplest single cell life remains unimpressed by the proposed spontaneous generation of a few building blocks of the cell. A monkey can type random letters on a keyboard. This observation in no way suggests that he can type a Shakespearean play. The Miller-Urey experiment and its subsequent versions continue to be used to justify the belief that life could have arisen spontaneously. Other experiments have documented that rather complex organic molecules can be created in the laboratory. For example, an article recently appeared in an online science journal with the headlines, "Life as We Know it Nearly Created in Lab. "* The article documented that scientists had succeeded in synthesizing RNA enzymes that could self-replicate. RNA, which is structurally similar to DNA, is believed to be an early step in abiogenesis. However, purposeful RNA sequences cannot form in nature without pre-existing DNA. Articles such as these are presented to be scientific and are elaborately ornamented with sophisticated scientific rhetoric that most people don't understand. However, analysis of the substance of this literature reveals the following logic. Man has the capacity to create self-replicating RNA enzymes under controlled laboratory conditions. It is therefore suggested that the exceedingly more complex self-replicating DNA can be created without intelligence. Research into abiogenesis is centered around the concept that if man can find a material basis for how the building blocks can be assembled from raw materials, that no intelligence was required to create life. Such a paradigm is no less rational than supposing that if bricks could form naturally, that a monkey without training could build a skyscraper. It is proposed that the naturalistic generation of subunits of living things indicates that abiogenesis is a viable theory. Articles have been published that RNA tetraloops and phospholipid envelopes can form naturally. Such observations fail to provide insights as to how life could form. In the first place, RNA tetraloops are not examples of genetic code. They are random subunits. Secondly, no autonomous self-replicating life is based on RNA. Life is not random molecules, but is highly organized. The natural occurrence of a few building blocks of life does not remotely suggest that life can form on its own. "An honest man, armed with all the knowledge available to us now, could only state that in some sense, the origin of life appears at the moment to be almost a miracle, so many are the conditions which would have had to have been satisfied to get it going. There is no evidence that a "pre-biotic" or "primordial" soup ever existed. There is universal agreement that the smallest known single cell life, a bacterium, could not have evolved spontaneously in one step from inorganic matter. No hypothetical pre-life forms can be shown to be viable or capable of reproduction, either experimentally or on paper. No viable theories have been proposed that demonstrate how a pre-life form could have evolved from raw materials. No pre-biotic life forms exist in nature. All experimental attempts to produce life have failed. A fundamental premise upon which the theory of evolution is based is the absence of intelligent design in nature. In the case of the origin of life from non-living matter, those who promote evolution have encountered an insurmountable roadblock. There is simply no possible pathway, even if one factors in vast oceans of ideal mixtures of the correct compounds and conditions, randomly interacting with each other, over billions of years on billions of worlds. The probabilities remain hopeless. Life is far too complex to self-organize by chance. Many believe that the theory of evolution is sustained by massive scientific evidence. They imagine that the challenge of abiogenesis represents a minor detail that will surely be worked out in time. It is contended therefore that a lack of knowledge in one obscure area does not dismantle a scientific theory supported by such compelling evidence. In reality, a massive house of cards has been constructed to defend evolution. The naturalistic origin of DNA and single cell life is not a minor detail, but is central to the entire evolutionary hypothesis. Without DNA, no life on earth is possible. The research into abiogenesis is not promising, but is discouraging. This is because every year the increasing comprehension of the complexity of single cell life far exceeds any insights man has achieved through experimentation designed to shed light on its creation through evolution. Science has no answer to the origin of life. All that can be done is imagine that someday new laws of nature will be discovered that provide the answers. This places abiogenesis in the realm of religion. Both the evolutionist and the creationist must concede that unknown laws are must have allowed life to be created. The only difference is that the evolutionist dismisses the possibility of God and assumes that other supernatural laws conform to his paradigm. He in essence has chosen one faith over another. Continued research into the origin of life is a naive and hopeless dream to anyone familiar with the empirical realities of chemistry and biology. The only investigators interested in such a hope are those who have an unalterable faith in the worldview of materialism.